Well tonight is Conan O’Brien’s last night on the airwaves as host of the Tonight Show. And so I’ve decided that tonight will be the last night I watch NBC, and by extension my local NBC affiliate, WAVY-TV 10. As of now I’ve deleted all episodes of Heroes I had planned to watch, and yesterday’s Community is the last of that show I’ll be seeing. It’s unfortunate I have to stop supporting a good, new show that deserves the ratings, but there you have it. I can’t sit by and help fun the network that’s destroying what I consider to be the greatest thing on modern television. Uncharacteristically of me I actually took the time to send a professional snail mail letter to my local NBC affiliate’s, WAVY-TV, president and manager, explaining why I would be switching off his station forever, a station that I’ve watched since 1993. Here’s a copy. I’ve been a viewer of your station ever since moving to the area in 1993. My household has enjoyed your station and your newscast for years and has even contributed to your “10 on your side” segment in the past, as well as enjoying programming provided over the air for years by your network. However by the time you read this letter we will have turned off your station forever. In light of NBC’s deplorable treatment of Conan O’Brien I’ve decided it’s best to turn off NBC entirely, and by extension your station. I know this isn’t actually your station’s fault, but I refuse to support a network that has ruined one of the few remaining good things on television, and by extension that means I cannot support anyone affiliated with NBC either. I will also be posting this letter online for public viewing and encouraging everyone I know to switch off NBC and your station as well. Goodbye WAVY, it was nice knowing you. Included with the letter was the image you see attached to this post, printed on an index card, in case the letter wasn’t clear enough. 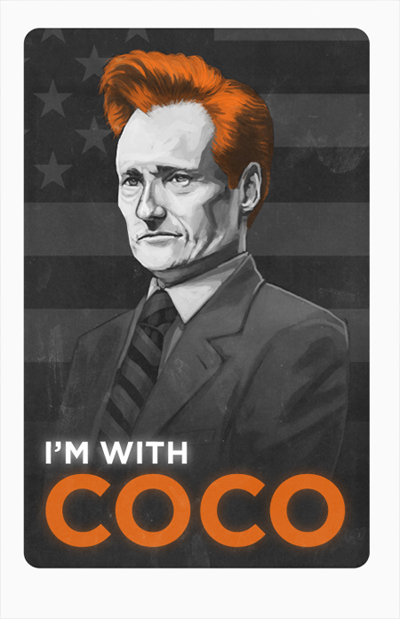 Conan O’Brien has been a treat for me to watch for years now. Stretching all the way back to the mid-90’s I’ve really enjoyed watching him on TV. I mean, I like Jay Leno too, but once his monologue is over and he starts actually talking to people, well, that’s it, he turns into a dry boring corporate-man who only serves as a vehicle for the person across from him to sell whatever it was they want me, the viewer, to buy into this time. I always loved watching Conan’s show because he spent more time on comedy sketches and because I thought he was much more lively and personable with his guests than other hosts. Guests on Conan’s show seemed to always be more relaxed, more lively, more willing to joke and have fun, you know, like an real conversation. A definite improvement to the common “I’ll just be a sounding board for you to make plugs… uh-huh.. ok.. let’s show that clip,” that I’m used to seeing everywhere else. I remember clearly to last year when it sunk in that the schedule at NBC’s late night was going to be changing. I remember feeling a lot like I do now. A whole lot of rumors, few updates, and no way to really know what’s going to happen. I remember really being worried when there was talk even back then that NBC was going to bump off Conan after he’d packed up Late Nite and had prepared to move when their was talk of Jay Leno wanting to keep the Tonight Show spot after he had decided to retire in 2004 and all the contracts to pass the torch had been signed. However in that case, after lots of waiting and no updates, things turned out ok, and I got to see Conan on in the Tonight Show spot, and it was great. The Tonight Show since then has kept a constant place in my DVR (That’s how I watch /all/ my shows) and I watched religiously for the first month or two, setting aside that time to watch it with others in the household. It was a little awkward at first, and there wasn’t as much time as their used to be for sketches, and I could tell that someone had wielded the censorship truncheon in their somewhere as well, but hey, all was good and it could only get better from there. So now it’s 7 months later and the turmoil of 2007 has come back again like nothing ever happened, another “gotcha” moment for the universe loves so much, and it’s looking like Conan’s going to be leaving NBC. Jay Leno’s 10 o’clock spot isn’t doing so well. I don’t know, maybe his viewing crowd is just those who still think watching the 11 o’clock news is the best way to get information. Either way it looks like they’re set to reverse a decision they made back in 2004 to pass the torch to keep Conan, spurred by Leno’s desire to retire, and to keep him from taking offers better than his Late Nite gig unless Conan agrees to make The Tonight Show “The Tomorrow Show” and push poor Fallon (Who is awesome) even farther, something Conan has stated he’s dead set against. It seems like the “big three” are just determined to grind anything that might be worth watching into the dust? Kings was riveting, that got canceled. Better of Ted is hilarious, and that’s probably going to be canceled. Community got extended, but that seems to be on the chopping block too, and Heroes seems to only stay on the air so NBC can pointing to something they air as entertainment. And I do love watching House… ok, so that one’s not going anywhere. (For now) So out of my list I’ve got a bunch of shaky items and a sure bet. Compare that to Cable TV where I’m riveted to shows like Burn Notice, White Collar, Eureka, Mythbusters, Man v. Food, and I just feel a little let down by what are supposed to be “The Big Three”. I think I’ve spent more time watching Web Series from the Angry Video Game Nerd and That Guy With The Glasses this past year than I have “The Big Three”. How sad is that? Why should I have to scrimp and scrounge through the three networks with the most funding, many of whom own the cable networks showing “the good stuff” to find something that isn’t reality TV, a law and order clone, or an ER clone? Update: This site has a nice update of the entire debacle. It’s a bit vitriolic toward Jay Leno, but it is also pretty accurate with the events as they occurred.